The Screenwriters Association is always keen to help its members realise the dream of telling their stories and build their careers. This time, we’re happy to extend support to Star Writers Program as a way of helping aspiring writers find an opportunity to enter the television industry. This program is designed by Star India to provide a professional writing course for television series in India. This program was started in 2016 and it is currently one of India’s most immersive course in television writing. 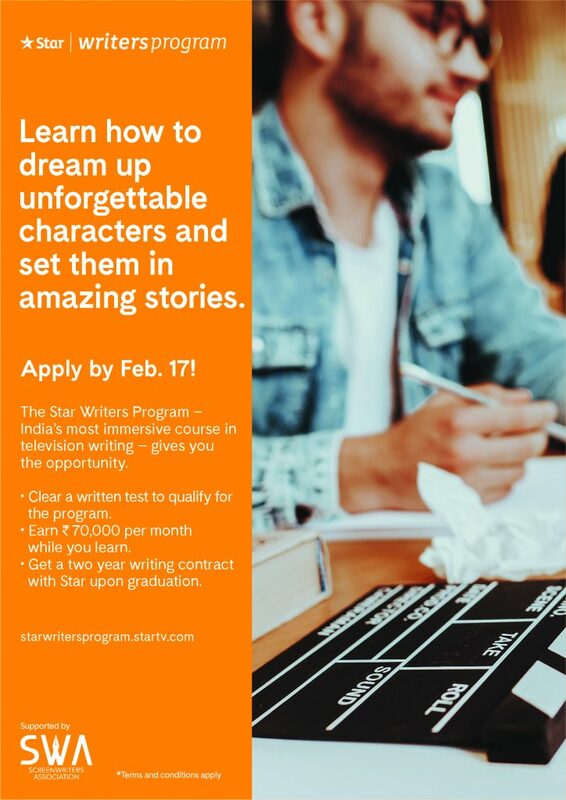 In its third season now, Star invites all aspiring writers to build on their skills through an intensive seven month course in screenwriting. To get selected, the registrants have to submit the two Writing Challenges on the website: Story Challenge and Scene and Dialogue Challenge. Each completed application is read by a panel of professional screenwriters, before participants are finalised for the next round to be held in Mumbai. Each year, the program receives over thousands of applications. The selected applicants are invited for Mumbai Challenge, a 2-day event in Mumbai (travel and stay to be sponsored by Star). At this event, participants learn storytelling techniques and meet the team in person. On the basis of the submissions and personal interviews held during the Mumbai Challenge, final 15 students are chosen for the program. The trainees inducted into the program earn a stipend of INR 70,000 per month during the 7-month training (5 month classroom+2 month internship) and on successful graduation, they get a 2 year writing contract with Star to work on their biggest shows. This year the classes are expected to start in August 1st week. DISCLAIMER: It is understood that under no circumstances the Screenwriters Association (SWA) shall assume any responsibility for or obligation or duty with respect to any part or all of the Star Writers Program, of any nature or kind whatsoever, or any matter or proceedings arising out of or relating thereto. SWA shall not be required to take any action of any kind to collect or protect any interest of its members in relation with Star Writers Program, and in no event shall SWA be liable to its member or members for any loss of intellectual property, anticipated profits or other consequential, special or indirect loss or damage of any nature arising at any time, whether arising under contract, tort (including negligence), strict liability or dispute situation or for any other cause whatsoever. This entry was posted in Notices on February 6, 2019 by SWA Editor.